Suppose you've been using XP for a few months. How can you tell if you're doing it properly? The ultimate measure is the success of your project, but you may wish to review and assess your approach to XP as well. This quiz helps you do so. 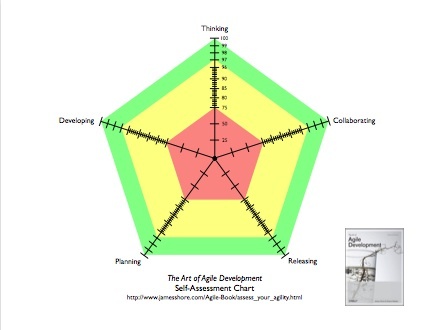 It focuses on five important aspects of agile development. It examines results rather than specific practices, so you can score well even if you've customized XP. It also works if you aren't using XP. The quiz assesses sources of risk. Your goal should be to achieve the maximum score in each category. The goal of the quiz isn't to tell you if you're "agile" or not--it's hard enough for a human to do that, let alone something printed on dead trees--but to give you an idea of where you could improve, and what your biggest sources of risk are. Anyway, as a special treat this week, I'm including the whole quiz online so you and your team can try it. I suggest taking the quiz individually and then graphing all of your answers together, on a single worksheet. The result will not only tell you about opportunities for improving your agile practices, it will also help you see where you have potential misunderstandings on your team. The point values for the questions come from an algorithm that ensures correct risk assessment of the total score. A 75-point question is not actually 75 times more important than a one-point question--we just had to use such wide variances to get the totals to come out right. Shane and I snuck a little in-joke in there, too, at the risk of getting flamed... see if you can spot it.